Mechanical drawing of my EPD ePaper display GDE021A1 is shown below. Signals to the display are connected via a 24-pin flex flat cable. The pitch between pins is only 0.5mm. A suitable matching connector is MOLEX 52435-2471 FPC RCPT 24PIN 1ROW. On Thursday I tried soldering thin wires directly on the MOLEX connector I got from Farnell. However, my attempt was very naïve because the pitch between pins on the connector is only 0.5mm. So I failed. As the second attempt I designed a small prototyping PCB board to hold the 24-pin MOLEX FPC (0.5mm) connector for EPD display and a standard 24-pin header (2.54mm pitch). The PCB connects all MOLEX signals to the header. The board also includes all capacitors, a power transistor, a coil and diodes for switching/mode power supply to power the display. The circuit is copied from the display’s datasheet. The scheme for the PCB board is in this PDF file, and the PCB layout is shown in the picture below. The dimensions of the board are 42x38mm. On Friday I sent the PCB to OSH Park for manufacture. As this is my first order in that company I am quite interested how it will turn out. I hope to get the board in about a week or two. As usual, schematic and layout for the prototyping board in KiCad format are in the project repository. UPDATE: The boards arrived on June 11, so it took full 3 weeks. I can recommend OSH Park for PCB manufacturing. I used this service several times, always without any problems. Hello. 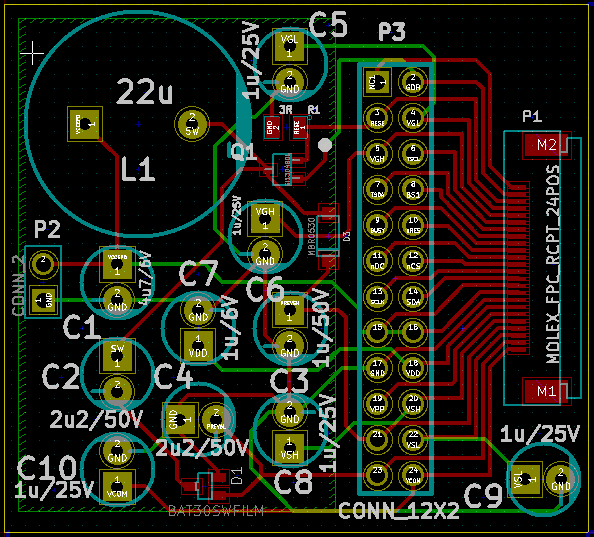 Please give pcb layout to print at home. 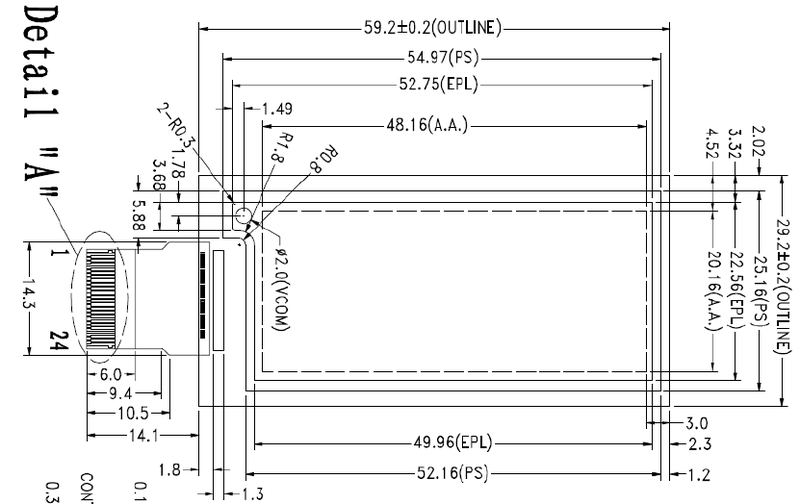 Ver nice work .. where can i found the layout for 24 pin tft display ? this is my tft display BF 70907001 .. where can i found the pin layout i want to solder on the motherboard an vga cable to output to an monitor !